Le Creuset Rectangular Dish 3-Quart 12"x9 1/2"
Le Creuset's Stoneware is truly an All-in-One Dish that you can use for baking, slicing, serving and storage. Stoneware can be used in the oven, broiler or microwave and will not absorb odors or flavors. The durable finish resists chipping, scratching and staining. These beautiful pieces with their bold classic colors and sure grip handles go straight from baking to tabletop, making an impressive presentation. The lid from our larger 4 1/2 qt. 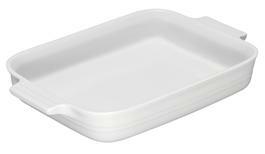 Rectangular Casserole will also fit on this size rectangular dish for added convenience in the kitchen.